This post is Part IV of the larger mini-series titled “A California Christmas.” The posts in this series include: Part I: Ten Ren Tea Station, Part II: Din Tai Fung, Part III: Sushi Gen, Part IV: Mrs. Knott’s Chicken Restaurant, and Part V: Melisse. Knotts Berry Farm is a theme park not far from Disneyland. Looking at it today, it looks like many other theme parks across America. The park is filled with characters from the Peanuts gang, wild roller coaster rides, and various other rides. What’s different? If you look closely, you’ll notice there’s this fried chicken restaurant right at the park’s entrance that always has a HUGE line out the door. What’s the deal with this restaurant? Guess what? This little fried chicken restaurant is what started this entire theme park. I won’t go into a detailed history here, but here’s a super brief synopsis. The Knotts family were berry farmers, and Mr. Knotts had just started selling a new berry created by a man by the name of Rudolph Boysen. The Knotts family bought a plot of land in Southern California and created a berry farm. Mrs. Knotts set up a tea house there, and one day was frying up some chicken for dinner when a tea guest commented on how delicious it smelled and whether it was for sale. The Knotts decided to temporarily sell fried chicken to make ends meet (it was the Depression, after all). However, the fried chicken became so popular people just kept coming back for more. Mrs. Knotts kept insisting she wasn’t in the restaurant business, but the people loved the chicken, and the lines grew and grew and grew. Eventually, Mr. Knotts started building some rides to entertain the people while they were waiting in line for the fried chicken. And that is how Knotts Berry Farm (the theme park) began. Of course, with all that hype, I was really curious how the fried chicken would taste, since to this day the lines are still super long. This is why I have never gone before – I never wanted to wait so long in line. Amazingly, this past Christmas Eve, our party of 14 was seated immediately. No line! Note to self: Knotts Berry Farm is a great place to come on Christmas Eve. None of the rides have a wait, and you can go into the Fried Chicken restaurant without a wait at 12:30PM for lunch! The wait staff are dressed up in traditional gingham outfits, maybe as part of the thematic experience. We started out with some nice hot rolls, which were delicious! Reminiscent of monkey bread, they were very warm, soft, and tasted great with butter. The sides/starters were actually quite disappointing. The rhubarb was just boiled with a bit of sugar, and the salad had a dismal dressing to vegetable ratio. The chicken soup was nice and thick and pretty good – probably the only redeeming starter. The fried chicken was good. I know fried chicken is all the craze right now, and every celebrity chef seems to want to offer his or her own version of fried chicken. This fried chicken is not fancy nor expensive. It’s just good, solid fried chicken. Crunchy on the outside, nicely flavored, and moist meat on the inside. I can definitely see why it was so popular decades ago when Mrs. Knotts first started making it. Definitely order fried chicken if you come here! And if you go, you have to get the boysenberry pie – more for historical nostalgic reasons than pure taste. As I mentioned earlier, the Knotts’ family started out as berry farmers, and this was the berry that Mr. Knotts had invented. Definitely try the pie – it’s good. The fried chicken is definitely good, though by far not the best I’ve ever had. At this point, I think the hype surrounding the restaurant is more historical and nostalgia than purely the quality of the food itself. The story itself is really cute, and it’s kind of fun to eat in this restaurant knowing that history. It’s worth visiting once, especially if you can avoid waiting in line. Having said all that, I don’t think I would be willing to wait in a long line just for the food. In this day and age, there’s plenty of delicious fried chicken to be had. I love love love fried chicken. And I also hate when people try and mess with it and make it fancy. So I would be all over this chicken. And that salad is absolutely drowning in dressing! Fact – I like all fried chicken no matter how bad it is haha. Great history. I love fried chicken. I’m not sure I’d wait in a crazy line if it wasn’t fabulous though. But at least there are rides to entertain! Uh, is that a vat of salad dressing on your two leaves of lettuce? Hah. Sorry, couldn’t resist. But you’re right — the pie looks pretty awesome. you don’t have to get fried chicken.they have a fairly large menu.I absolutely love the chicken and dumplings especially if it’s chilly outside.They’re served piping hot and go great w/ those biscuits.Also for dessert they have boysenberry sherbet that’s delicious,I’m not a pie fan but I love boysenberrys.We come here every time we go to Disneyland,you don’t have to go to the amusement park,you can just come and have a lovely very reasonably priced dinner.P.s. the best time to go is midafternoon to avoid the inevitable long line. Right, so Walter Knott invented a berry, decided to call it the boysenberry instead of Knottberry. Ever since Cedarpoint bought the farm, literally, the story has been re-invented. And the biscuits are buttermilk. Sadly the quality of the food has been on the decline for the last 10 years. Actually he did not invent the berry. His friend Mr Boysen has them growing in his back yard and Mr. Knott took the plants and started growing them commercially. When he went to name them he named him after his friend who had discovered them. I know this because we have a family friend whose mother was very close with Mr. Knotts family physician. Which may seem kinda wierd but she knew the Knott family from him. She actually has a signed copy of a book that Mr. Knott had specially printed just for friends and family. So the story has not been reinvented just not everyone knows the full story. thanks for the clarification. I think I looked into this after writing this post and your description confirms what I read – he actually bought it from someone and commercialized it. I’ll update the post accordingly. Thanks! And that’s cool you guys know someone who knew them! I heard so much about these place and their famous fried chicken although I haven’t tried it for myself, I guess a great fried chicken should be crispy outside and juicy inside. The story of how their business had started is also quite impressive. 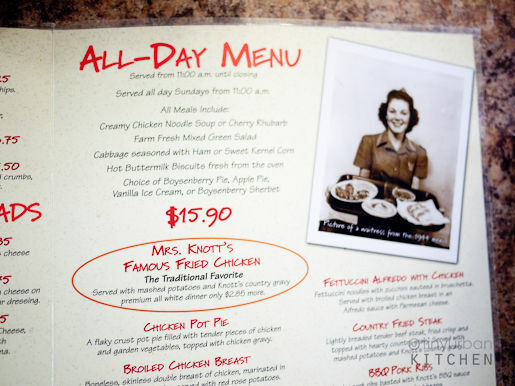 Our family loves Mrs. Knott’s Fried Chicken Restaurant. My mom went there with her parents and I grew up visiting it. We actually drive an hour and a half to two hours just for dinner or lunch and not even bother with the park. (That’s each way) Yes, a large part is nostalgia but I really love the rhubarb soup. I just bought a huge batch so I can try making it myself. Now that our kids are grown my husband and I go every year for Thanksgiving and to enjoy the park’s Christmas craft faire which starts that day. If you go inside the park, try the Ghost Town Grill. Great chicken wings and I’m mad about the Parmesan Crusted Chicken Salad. Cool! Thanks for the tip! I didn’t even know about Ghost Town Grill. I love the Creamy chicken soup. I wish someone could do a copy cat recipe. That stuff is the bomb. Living in Spain for 18 years now but just had a craving to go to Knott’s for the chicken dinner.50 years ago was the first time I went and it was always great!Most people never have eaten rhubarb and it’s a great introduction!Don’t expect fine dining here but you’ll want to come back and have a bit of patience…The recipe of soaking and chilling and flouring and chilling is the key!fantastic home cooked meal! I grew up visiting Knotts Berry Farm pretty regularly. I remember when it was free. Then when they started having a problem with the Hippies Knotts started charging $2 to get in. From there the park has continued to grow. I personally think it declined some when the family sold the park. Every time we go back to California we always eat at the Chicken House. I love the biscuits and the Rhubarb. Luckily some of my family don’t like it so I get to eat theirs too. Actually, Mr. Knott built the Ghost Town to entertain people as they waited to eat. The roller coaster rides came much later, once the park became the main draw. Before that they had stagecoach rides and a mule train ride with real mules. I’m not sure if the stagecoach is still there, but I’m pretty sure they stopped the mule rides a long time ago. I also seem to remember that at least some of the ghost town buildings were brought here from a real ghost town, Calico, which you can also visit out in the Mojave past Barstow.